The day started without water. So we had to wash with bottled water. The view out of the window next to the showers and toilets was right into the backstreet of the hotel. So we saw the non touristic face of Yangon. The ground was covered with trash and you could smell it. But we had an excellent breakfast and we decided to walk around in the streets of Yangon first. For three hours we walked through all the big and small streets in the city center. The life of Myanmars capital is definitely right on the street. They are full with people and street vendors, stalls, shops and steet food places. And in between you can find the betel nut stalls. Kun ja, (as the Burmese call it), has been around for thousands of years in Southeast Asia as a mild stimulant but is also said to be good for chronic bad breath and getting rid of intestinal parasites as well. Betel nut isn’t really a nut but rather the seed from the areca palm wrapped in betel leave. Around 600 million people worldwide are thought to chew betel quids, making them the fourth most commonly used psychoactive substance after tobacco, alcohol and caffeinated drinks. I also tried it but I don´t have to try it for a second time. The most interesting things were the smiling faces of all the people. Many guys asked us: “Where do you come from” And it seems that my tattoos are like a magnet to the Burmese. Everyone was kind of interested. 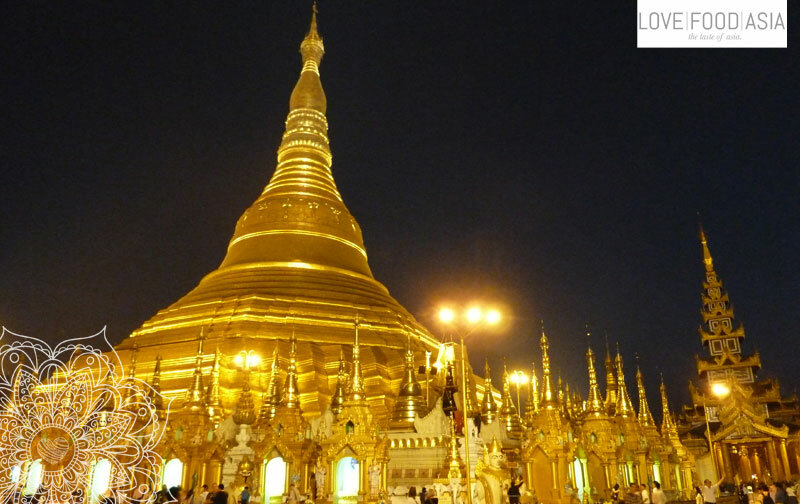 On the late afternoon we walked up the Shwedagon pagoda and we spent the whole evening there. The atmosphere up there is amazing. It is hard to describe. Pictures are not enough. You have to go there on your own. At the Shwedagon Pagoda a younger monk came and asked me about my tattoos and so we started a long conversation. He showed us around and explained everything about the pagoda. We spoke about life and meditation and he gave us a zip of holy water from the foot print of Buddha. This monk had such an inner balance that we had to stay with him until sunset. An inspiring moment in Myanmar. Tomorrow we travel to Mandalay by night train. The railway company which was built by the English is more like a nostalgic company but the trains are still running. We bought our ticked today and it was handwritten. We expect an unforgettable trip. 95 % of all tourists take the much more comfortable night bus but we are looking for some adventure.